vinegar | eat. drink. cook. travel. As you can tell, I haven’t had a great deal of time to cook lately. It’s mainly been work, and keeping up with the various bits and pieces that make up a full life. Am also juggling a new personal project that I hope I can share at some point soon. Unfortunately, cooking has taken the, um, back burner. Today I only managed to quickly rustle up some lunch out of bits and pieces in the fridge and it turned out pretty well! I knew I wanted something healthy, so it was brown rice and cracked buckwheat. 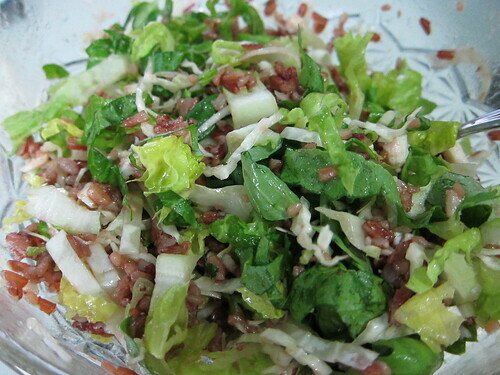 There was leftover romaine, cabbage and basil in the fridge, together with some fish slices. I was inspired by a version of nasi ulam Mum made a few weeks back where she shredded fried wolf herring into rice and local herbs and squeezed plenty of lime juice over it. This time, I wanted a Western version of it and did the lazy thing of combining it all with olive oil and balsamic vinegar. It turned out pretty well! Cook the brown rice and buckwheat together with the water in a rice cooker. When cooked, fluff the rice mixture and stir in the fish slices. Turn off the cooker and leave the fish to cook in the residual heat. Prepare the vegetables (wash, slice, chop). Combine the fish and rice mixture with the vegetables and tear the basil leaves gently over. Stir in the olive oil and balsamic vinegar, top with a few grinds of salt and pepper to taste. Toss and serve. I’ve been a regular at Bedok South Hawker Cenre’s Opera for a long time. The auntie who took order would take one look at me and tell me my order immediately. It’s too bad she’s not there anymore, but the auntie who makes the noodles is still there. 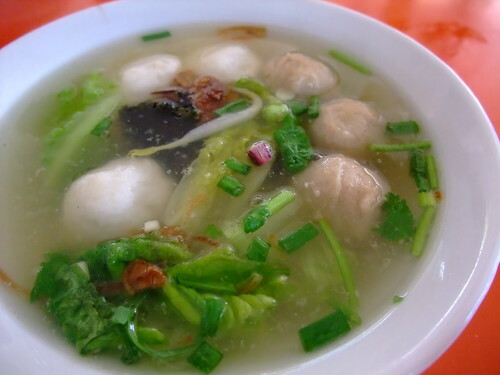 I also ask for extra vegetables for $0.50 more and they give me a much bigger bowl of soup plus extra fishballs and other ingredients. This is worth my while because it’s the only accompanying soup worth drinking. At other places I invariably leave the soup untouched because it’s just msg and water. Here, things are quite different and I always finish every drop of the soup. It’s fantastic. What’s not so great about it? The meatballs are only a notch above run of the mill and the meepok can sometimes be soggy. Go for the meekia or meesua, both the dry version. Both are excellent. I’m going to be horribly lazy today and post a recipe for something that doesn’t quite count as cooking. I’d bought a pack of organic herb salad and wanted a fairly virtuous dressing that would stand up to the herbs but not interfere too much with the already complex flavours. A peek into the fridge and the idea hit: anchovies and mustard. Together, they would make a very assertive yet blunt combination. Add a splash of balsamic vinegar to round off the flavour, a good couple of squeezes of lemon juice to sharpen things up, then emulsify with good extra virgin olive oil and voila, a quick salad dressing that complemented the herb salad incredibly well. 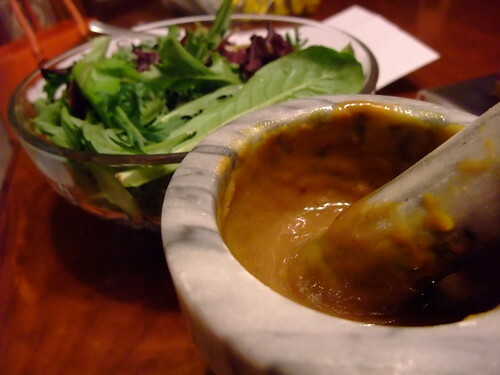 In a small mortar and pestle, mash the anchovies to a paste, then stir in the mustard and keep grinding gently with the pestle. Add the vinegar and lemon juice and stir to a thick paste. Add the olive oil in drops at first, stirring vigorously, then gradually add more till you get a running, emulsified dressing. Taste, adding more mustard and vinegar if it’s too salty. Dress the salad to taste. Serve. Try not to look too unglam as you lick the bowl clean. 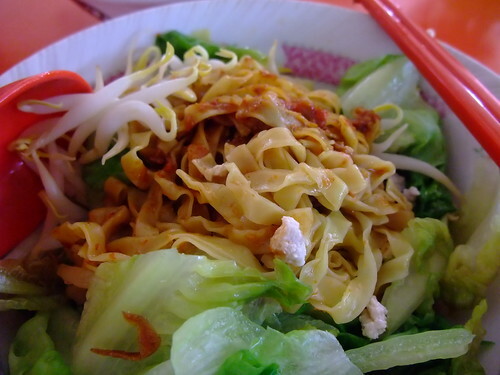 A friend introduced me to the bak chor mee at Crawford Lane. This is Tai Hwa, not to be confused with Tai Wah. Unlike Tai Wah, it is the only stall with no branches anywhere else. We got there at 10.30 am and there was no queue at all. Apparently during the peak period, the queue would stretch the length of the coffeeshop. We were in luck! This bak chor mee ($4 up) is probably the best all-rounder so far. The noodles were perfectly al dente, as was the balance of chilli and vinegar. I also really liked the thin slivers of deep-fried lard that delivered the highest crisp vs. calorie ratio. They were just the right size: thin enough to crunch nicely yet large enough to avoid once the guilt set in. The one piece of dried sole fish wasn’t enough and was slightly bland, but it’s a small quibble. The sliced meat, minced meat, liver and pork ball were all spot on, tender and juicy. The only let down was the dumpling, which was too salty. My friend didn’t notice, so I guess it was just me being too sensitive. Either that the uncle didn’t mix the dumpling filling well. This is what I try to make my typical breakfast: lots of fruit with some dairy and complex carbohydrates. I think it’s a tad heavy on the sugar, but at least the jam is homemade and the Yakult gives me some sort of lactobacteria. I slice bread only when I need it and end up lazily using the chopping board as my serving platter too. The bread I make is very dense and quite moist, like the German fitnessbrot I grew up eating, so it doesn’t go stale easily. It’s based on a Cooks Illustrated almost no-knead bread recipe. I’ve modified it slightly to suit my own needs. My bread is dense because my tins are non-stick, meaning that the dough doesn’t get enough grip to rise high against its walls. If you have a regular (as opposed to non-stick) metal tin, go ahead and use that instead for a lighter bread. Don’t oil the sides, if not the high temperature of the oven will turn it into a gloopy mess that takes an eternity of scrubbing to remove. And use only metal tins because you need the metal to conduct heat to get the dough hot immediately. Fear not, the rest of the process is dead easy. As for the flour, feel free to use all plain flour or all finely ground whole wheat flour, normally sold at atta flour or chappati flour at places like Phoon Huat. As long as the flour makes up three cups, try using a bit of rye or other grains for varying taste and texture. If you don’t have whey, just use water with a few spoonfuls of milk. Or try the original recipe with a quarter cup of beer in it. Blend all the ingredients together in a bowl and cover with a dry towel. Leave to rise for 12 to 18 hours. Punch down the dough and knead by pushing and folding over the dough 10 times. Put into a 20 cm diameter round springform tin and allow to rise for 2 hours. Preheat the oven 30 minutes ahead to 250°C or as hot as your oven will go. Cover the tin tightly with aluminium foil and put onto lower oven shelve. Turn down the oven to 200°C. After 3o minutes, uncover and bake for a further 30 minutes. Leave to cool for about 30 minutes. Cut and serve immediately to enjoy the crisp crust. Finally made it to the Bak Chor Mee at Bestway Building. We got there for a lateish lunch on Saturday afternoon. I was glad that we were spared the mythical 40-minute wait as there wasn’t much of a crowd this time. Everything else bar the drink stall was closed. Even though there were only two people ahead of us, our order took a while to arrive. The uncle takes his time with the noodles. First up, I liked the taste of the noodles ($4 up) very much. The chilli was quite fragrant and the vinegar was very mellow. A bit more chilli and vinegar would have made it much better. There was plenty of dried sole fish and they were also generous with the toppings: mince meat, liver, dumplings and meatballs. The meatballs were also spiked with dried sole bits, giving extra oomph. I wasn’t too keen on the noodles. The meepok was too soft for my liking. I could tell on first sight that it was soft, didn’t even need to bite in to know. Try ordering their dumpling soup instead, it’s got all the good stuff and none of the overcooked noodles stuff. For noodles, Seng Kee is probably better. Verdict: I liked the taste and the toppings, but the noodles were bad.